I found the unhealthy version of this recipe online so Celia Hodder and I decided to try out a healthy version and it was better than we could have expected!! Rinse strawberries and cut around the top of the strawberry. Remove the top and clean out with a paring knife, if necessary (some of them are hollow already. Prep all of the strawberries and set aside). In a mixing bowl, beat cream cheese, Splenda, and 1tsp vanilla until creamy. Add cream cheese mix to a piping bag or Ziploc with the corner snipped off. Fill the strawberries with cheesecake mixture. 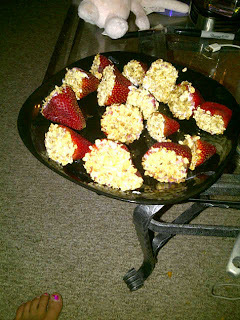 Once strawberries are filled, sprinkle or dip the tops with oats. If not serving immediately, refrigerate until serving.